Haley spent the first 18 years of her life in Cincinnati, Ohio, dreaming up grand adventures in her backyard, photographing local plants and animals, and anticipating the yearly hiking trip to Red River Gorge. Haley has a degree in Marine Science and Biology from The University of Alabama where she discovered environmental education while working with a local school garden project. After joining the staff at Walking Mountains as a Naturalist and Sustainability Intern in 2016, Haley has worn several hats within Walking Mountains including Lead Naturalist and Backcountry Interpretive Guide. 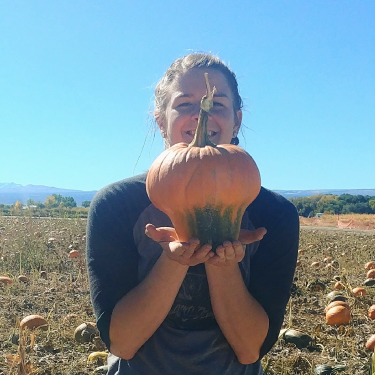 In her current position as Sowing Seeds Coordinator, Haley manages the school gardens at local elementary schools and teaches Sowing Seeds curriculum to students as a special. On a nice weekend, you’ll catch Haley at the crag, on the trail, soaking in a hot spring, careening down a small hill on roller blades, or maybe just cozied up in the sun with a nice book. When it comes to the colder months, Haley is just hoping to make peace with the snow after tearing her ACL three days into learning to ski last winter.